Are you looking to buy a property in Italy? We have properties for sale in Tuscany, Umbria, Lazio, Le Marche, Abruzzo and Lombardy (Lake Como). We have a large portefolio of properties at all times, consisting mainly of resale properties of all qualities and prices. As Tuscany and Umbria are most in demand, our selection here is far wider than it is f.i. in Abruzzo, Lazio and Campania. In Tuscany we have, for example, properties in Siena, Perugia, Terni and the surrounding provinces and in San Casciano dei Bagni, Cetona and Fabro. 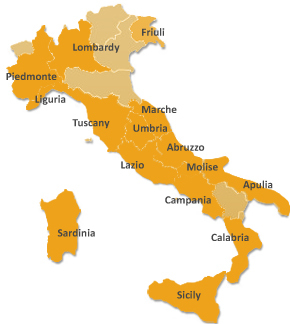 We also cover the southern part of Tuscany, and in particular the Val d’ Orcia, and the municipalities of San Casciano dei Bagni, Radicofani, Pienza, Montepulciano, Castiglion d’Orcia, San Quirico d’Orcia and the whole of the Val di Chiana (including Cetona, Chiusi, Sarteano, Chianciano Terme). In Umbria we mainly work in the western part of Umbria, covering towns such as Città della Pieve, Monteleone d’Orvieto, Ficulle, Parrano, Fabro, Montegabbione, Allerona and Orvieto. Casa Bel Sole specialises in finding overseas property in Italy, whether for investment, holiday home, or relocation. We are an independent company that understands that building a profitable overseas portfolio can be a daunting and frustrating task. Are you interested in investing in Italy? Increasingly, buying property abroad is becoming a popular investment choice. With the right Property Finder Agent it is also becoming easier buying property abroad than before. It is no longer only business moguls or people in their golden years who are looking to purchase overseas investment properties in both established and emerging property areas of Italy such as Tuscany, Umbria, Abruzzo, Lazio, Campania and Lombardy (Lake Como). You tell us what dates would be feasible for you to travel to Italy. We get in contact with the owners and organise viewings of your chosen properties. If the properties you have chosen are located far from each other you may not be able to see more than two properties per day. In case the properties are closer to each other, you may be able to see four or five properties. We recommend that you take your time when viewing a property, walk around to get a feeling of how it would be to live here, note down what you think are the pro’s and con’s etc.. If a property does not appeal to you at all, let us know, and we shall not waste more time on it. When you have found one or two properties you like, you may want to see it a second time, so please allow time at the destination for this, and also for visiting the nearby village/town and area. You book and pay your viewing trip yourself. We will recommend you accommodation close to where the viewing will take place and may also help you find a good deal on both flights and car rental. You sign the Purchase Offer and we bring it to the vendor who also shall sign it. If the vendor does not accept your offer, he/she puts his/her price in an appendix to the Purchase offer. The Purchase Offer goes back and forth between the vendor and yourself until you have both agreed on a price for the property. When the Purchase Offer is final, you pay a deposit, normally €5000; to the vendor within 10 days. A Preliminary Contract is made, usually within one month of the final Purchase Offer. You pay 20-30% of the total property price1. The Final Contract is made and signed, usually within 4 months of the Preliminary Contract. The remaining amount is paid to the vendor1. 1) These amounts are to be paid in Italian bank drafts issued by an Italian bank. We will help you open an Italian bank account and to get the “Codice Fiscale” (tax number) after the Purchase offer is finalised. The percentage you pay on the Preliminary Contract may vary, the time frames are also flexible, but all dates, percentages etc. will be laid down in the Purchase Offer, that is, in the initial stage of the process. We advise all our customers to use an independent lawyer who is an expert in Italian Law to see through the contract and other documents pertinent to the purchase. Although we gather all legal documents before publishing any property for sale (unless otherwise mentioned in the property description), we believe that such an important and costly acquisition as the purchase of a property is, deserves an independent quality check. If you have any questions to the above, please call or write to us, we are here to serve you!